Plant types are classified by the number of seed leaves (contyledon) found in their seeds. For instance, grasses have one cotyledon and are classified as monocots. Plants with two cotyledon are called Dicots. Seeds have been used in herbal medicine for centuries. Seeds are valued for their oils, ground powder forms and whole seeds. Many seeds have medicinal benefits as well as culinary uses. Many of the spices we cook with today have been used to improve health by ancient cultures. Some of these spices include coriander, cumin, poppy seeds, sesame seeds, dill seed, anise and mustard seed. Seeds have a variety of different parts. 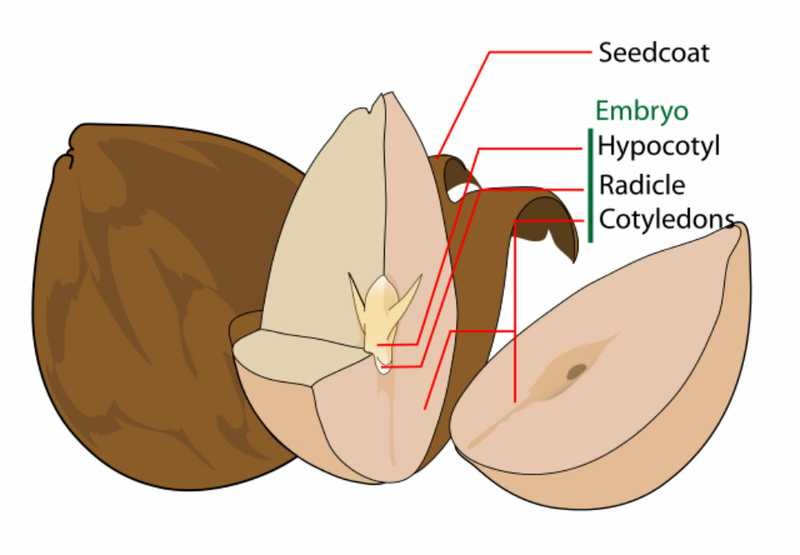 See the diagram on the left to identify what each part of the seed is. Seed Coat: Also known as Testa, is the outer covering of the seed. It protects the embryo from injury and drying out. Hypocotyl: Is the stem of the germinating seed. It is found below the cotyledons and above the radicle. Radicle: Is the embryonic root. It is the first part of the plant to emerge from the seed. Cotyledon: Also known as seed leaves, are wrapped tightly around the embryo. These become the Embryonic leaves or first leaves of the seedling plant.